Expect to see more of Uchenna Nwosu when the Bolts hit the field against the Buffalo Bills. The Chargers’ second-round pick saw only two defensive snaps in the season opener, largely due to the Chiefs’ personnel. Regardless, Defensive Coordinator Gus Bradley explained how the team should have found ways to get him on the field more last week. 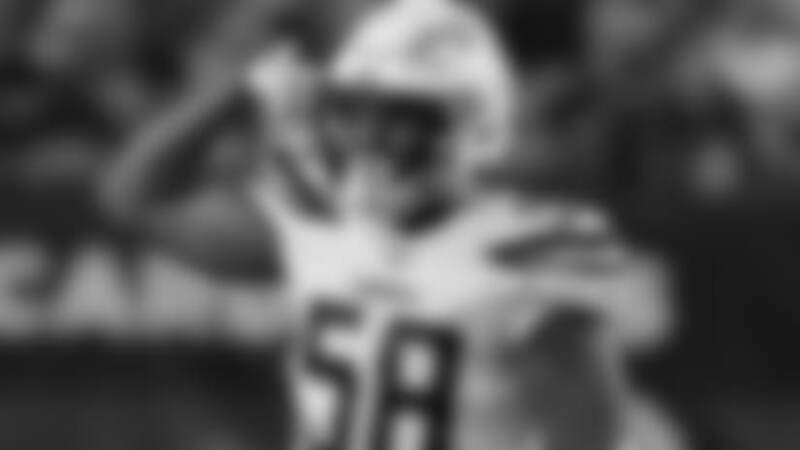 That’s going to change in Buffalo…and you’re also going to see him more up front than at his usual linebacker spot. While Nwosu stood out throughout the preseason at his usual linebacker role and as a rush end in passing situations, he’s expected to see a good amount of snaps at a different position – big end. That’s the spot usually occupied by Joey Bosa, who will miss his second straight game with a bone bruise in his foot. Isaac Rochell will start at the spot once again, but Nwosu should figure into the rotation this go around. While he’s been spending most of his time at OTTO and LEO, Nwosu doesn’t appear fazed one bit to now also be tasked the big end role. After all, it still allows him to do what he does best – get after the quarterback. However, he did note there are numerous differences when it comes to playing big end than at OTTO and LEO. As Bradley noted, Nwosu has spent extra time with his defensive line coach, Giff Smith, to further prepare himself for his new role. According the rookie, it couldn’t be going any better. Still, Smith’s not the only one giving pointers to Nwosu. Even back during training camp, the USC product spent as much time around Bosa as possible, picking his brain for any tips to improve his game. The hope now is those extra sessions prove invaluable as he helps fill in for the Pro Bowler against the Bills.